Everyone uses passwords. But not the way they should. Make yours unbreakable and protect your accounts from hackers. Gmail. Facebook. Your online banking. With so many accounts, it’s tempting to reuse your passwords – or worse, save them on your browser. The moment of truth. Are your password habits safe? Do you save your passwords on your browser? Do you consistently make sure your passwords are at least 8 characters long? Do your passwords always consist of UPPERCASE and lowercase letters, numbers and special symbols (!"£$%^&*()_…)? Do you ever use names of your significant ones, friends, pets – or their birthdays or anniversaries – in your passwords? And what about the classic "123456", "love", "letmein" — or even "password" passwords? Do you use a password manager to handle your passwords securely? Protect your passwords better, with Avast Passwords. %! What a password wizard! Still, you might want to check out the world’s safest password manager. Passwords encrypts everything in a 5-layer security vault, but your browser? It’s accessible to everyone. Choosing where to store your passwords should be an easy call. 12345 or your daughter’s name won’t cut it. Keep your accounts safe at home or on the move. Use Passwords on your PC, or smartphone. We’ve said it before, and we’ll say it again: It’s easy for anyone to view the passwords you’ve stored on your browser. Uh-uh. They don’t tell you that at school. 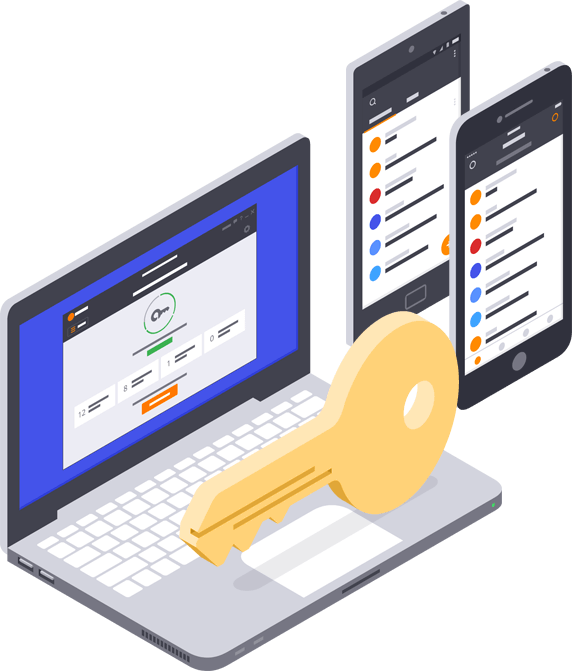 Passwords for PC doesn’t come as a standalone PC app (yet) – but you will find it in Free Antivirus, Pro Antivirus, Internet Security, and Premier. Well, almost. We’ll make sure you have a unique, unbreakable password for all your sites. You just have to remember one. From now on, this will be the only one you have to remember. Log in anywhere, using your new Main Password. Easy. Log into your favorite sites, and we’ll help you save your passwords just like you’re used to doing with your browser. Or save them manually – it’s up to you. Use Passwords on your PC, Android, iPhone - all at once. Just get the Passwords app for your device. That’s it. Now gloat (but not too smugly), knowing you’re covered. Even the most reputable services can get hacked. When this happens, we’ll tell you immediately so you can change your password. Infinitely safer than keeping your passwords on your browser.